Good News for all the candidates who are going to attend the competitive exam. In any competitive exam, the General Awareness is the main section that most of the aspirants fail to answer and loose marks. Since they don’t have much grip on the General Knowledge questions. The important days and years are one of the parts of the General Knowledge. 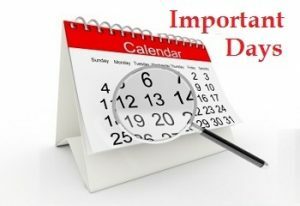 Hence, to help all those individuals we have provided a list of Important Days and Years of the World which are usually asked in the competitive exams like IBPS, SSC, UPSC, RRB, etc. Therefore, go through the National and International Important Days and Years available in the below table and prepare well for the exams. Therefore, check all the important days and years and prepare well for your exam. Not only this, we have also provided GK questions for other topics of the General Awareness on our website. So, visit our GK Page and check all the important questions related to the General Awareness.